Bonus Info: - 18+. T&C's Apply. Winner is a brand name that first made its appearance in 2009 and grew at an astonishing pace. 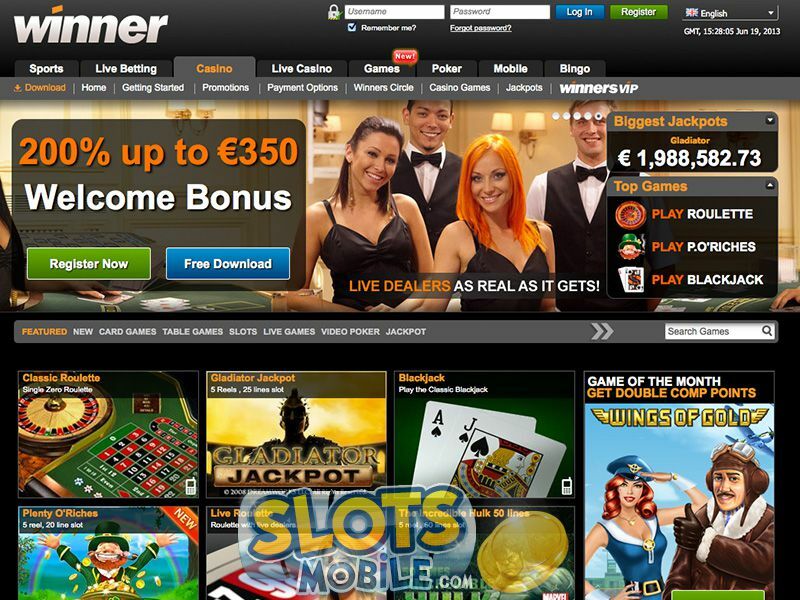 Today they are among the industry leaders, when it comes to online gambling sites serving European markets. Players can play poker, bet on sports, play bingo and of course casino games, which are also available on mobile devices through Winner Mobile Casino. This casino brand utilizes games from PlayTech, which means that you’ll get to play over 100 of them, including top industry titles. That number is the case for computer users, while those who want to use their mobile device, will have access to a dozen of them. When it comes to licensing, Winner is registered in Antiqua & Barbuda and also regulated by the government of this same location. Their owners and operators are Zirconium Gaming Limited, with offices registered in Israel. Winner Mobile welcomes all new players with a pretty nice and generous offer – a deposit bonus of up to $1,500 or equivalent in your preferred currency. This offer comes on top to the $30 free voucher Winner is giving away to all new customers, with the only requirement being signing up. The deposit bonus features a 50% match, so you'll have to deposit $3,000 in order to claim the full offer. Apart from regular and somewhat generic bonuses, there's also constant value added in terms of promotions. You'll get to participate in daily and weekly prize draws, awarding cash, reload bonuses and even electronic gadgets! 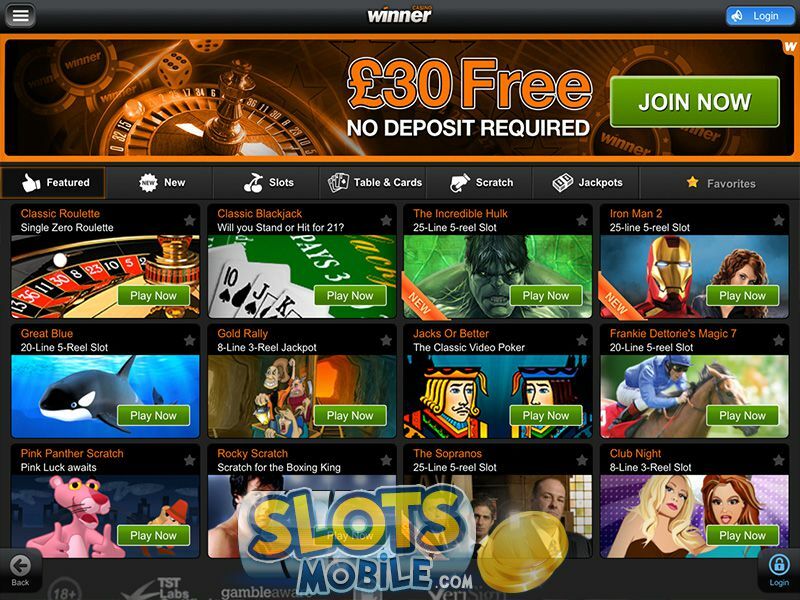 PlayTech, the company behind all games found at Winner, was one of the first ones to introduce mobile compatible casino games. They have still remained innovative and constantly improve their games, add new ones as well as work hard to make them tailored for most popular platforms, such as iPhones and iPads. These two were the first compatible devices too. The range of games includes popular table games, Roulette and BlackJack that is, as well as some of the best slot game – Gold Rally, Rocky, Pink Panther, Great Blue and Desert Treasure are all available! Note that many of these are progressive and playing from a mobile device won't put you in any kind of disadvantage – you can still claim all these jackpots. Apart from Apple designed devices, Android powered ones, such as smartphones and tablets, are also supported and users of them can enjoy a dozen of games that aren't just compatible, but rather specifically designed for a great experience, when playing from these devices. As a rule of thumb, you can count your device as a compatible one, if it supports Java technology. Most of them do, including BlackBerries, Nokia and Windows Mobile powered phones.